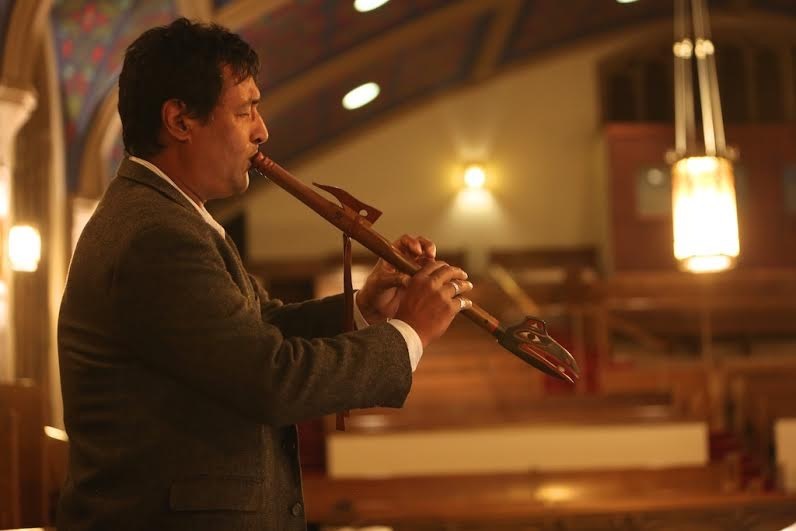 Eagle Festival Week Two – Come for the scenery, stay for the programs. 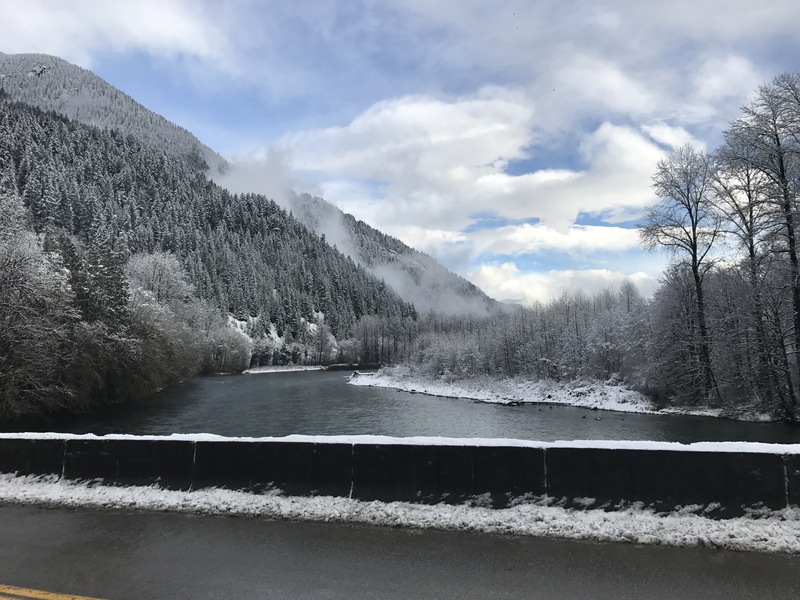 Activities abound this weekend in the upper Skagit. 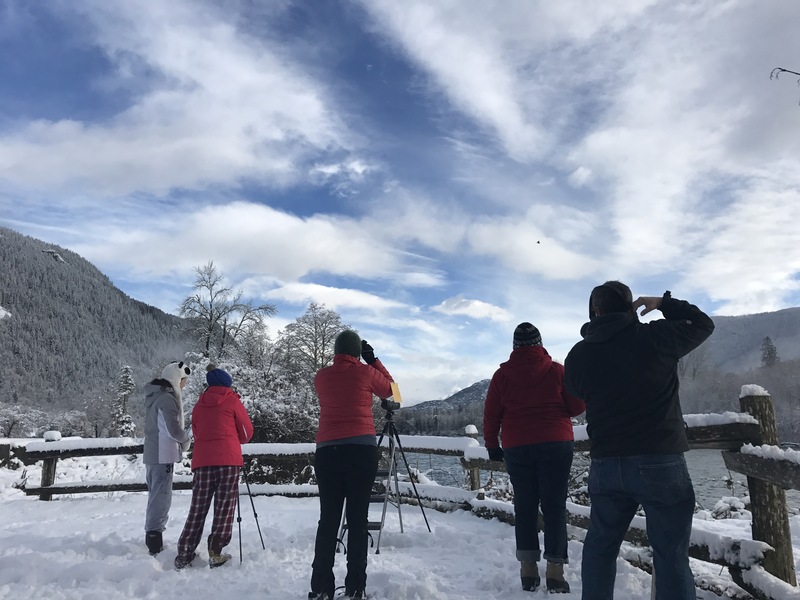 While the bald eagles appear to be plentiful on the Skagit and Samish Flats, upvalley in Rockport and Marblemount there are many special programs available for free! local native arts & crafts vendors, and fry bread tacos all day. Open Saturday and Sunday 10-4. Enjoy a warm fire, refreshments, a gift shop, and daily programs. At 11:00 take a 90 minute guided walk with a US Forest Ranger. Indoor presentations are offered at 1:00. 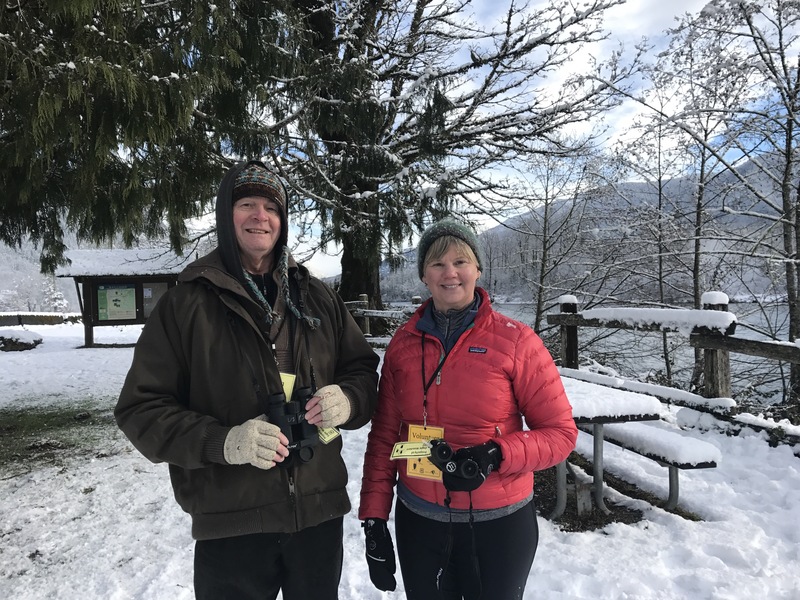 Saturday : Dr. Steve Glenn will talk about winter birds of the Skagit. 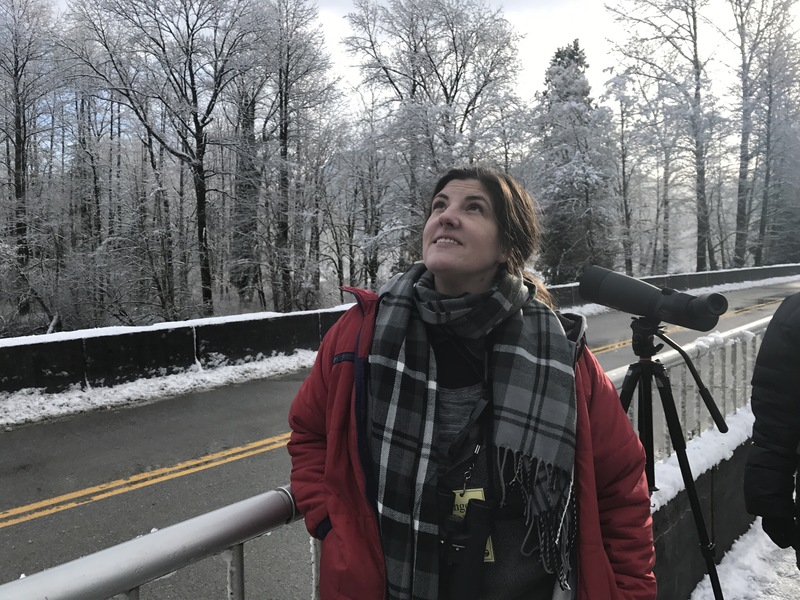 Sunday: Taylor Schmuki from Skagit Fisheries Enhancement Group presents Salmon Habitat Restoration Projects in Howard Miller Steelhead Park. 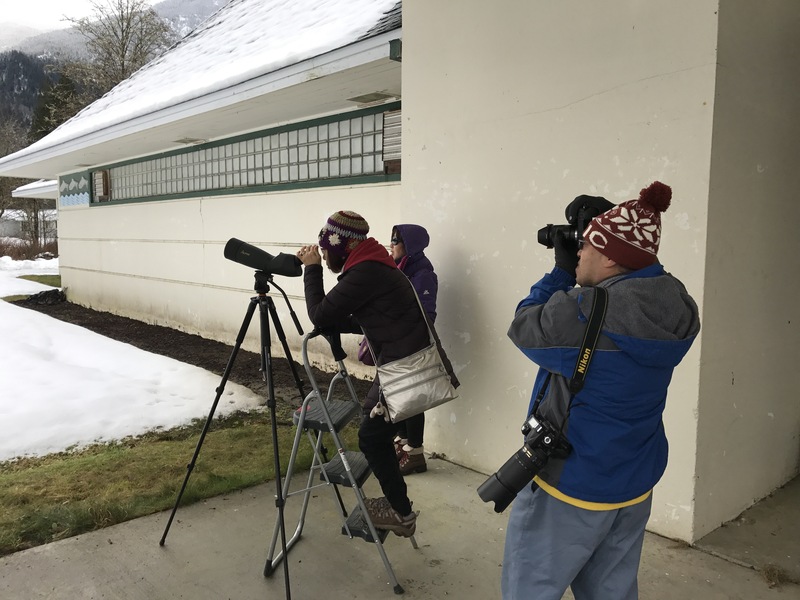 Eagle viewing stations are located at Howard Miller Steelhad Park, Sutter Creek Park (milepost 100) and Marblemount Fish Hatchery. We will be there from 10-3 Saturday and Sunday. All the above programs are free and the weather looks fine! 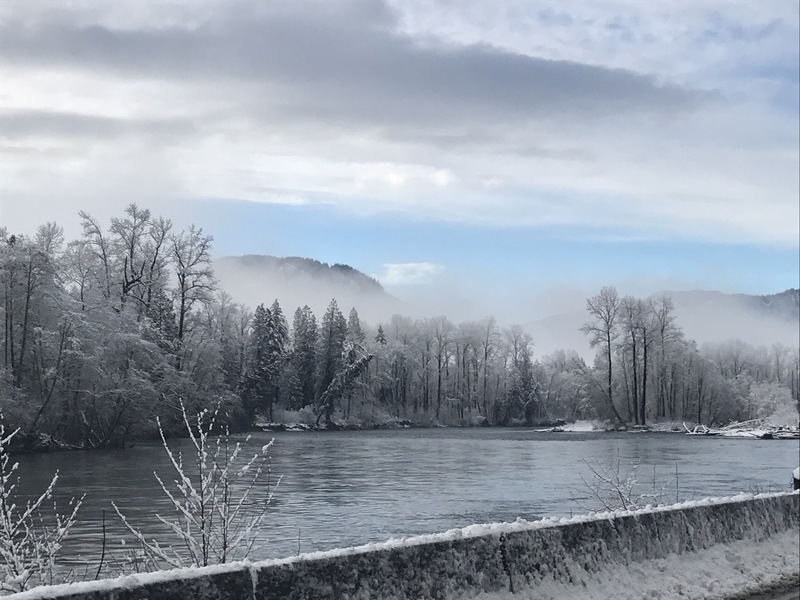 With potentially dry skies and temperatures above freezing, it looks like a great weekend to hire one of the local float trip guides for a boat ride and enjoy the beauty of the river. Have you ever tried it? 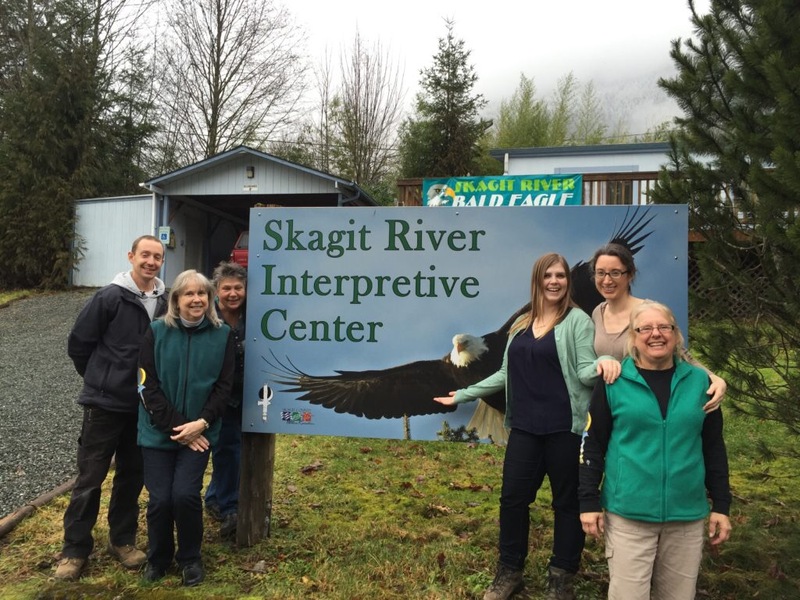 Looks like nice weather for weekend two of the Skagit Eagle Festival. Sunny and above freezing! It’s been a while. Just be prepared. Snow and ice are still lingering, especially in Marblemount. Some side roads and parking lots are still slippery. All the eagle viewing sites are accessible for driving. Just be careful walking around. No viewing stations open Sunday Jan 8. 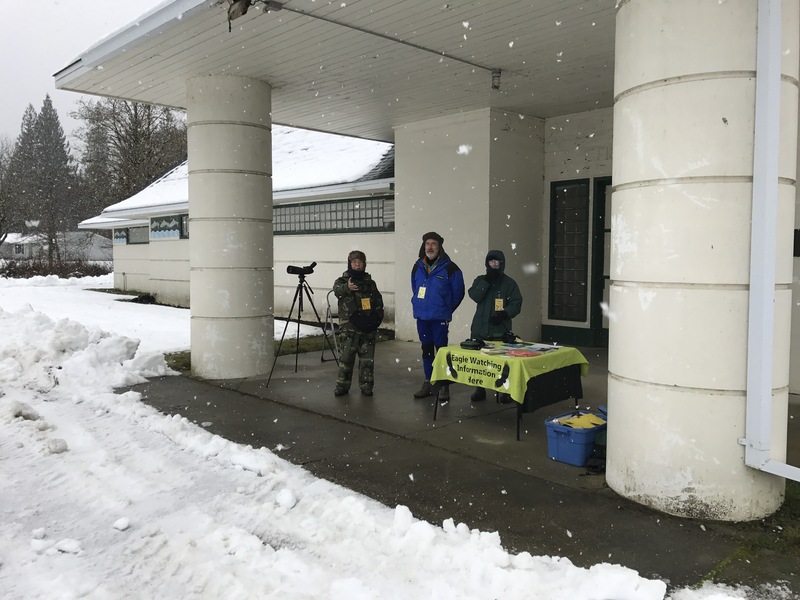 Due to high winds and freezing rain in the forecast, we will not be opening the volunteer-staffed eagle watching stations tomorrow. See you next weekend! 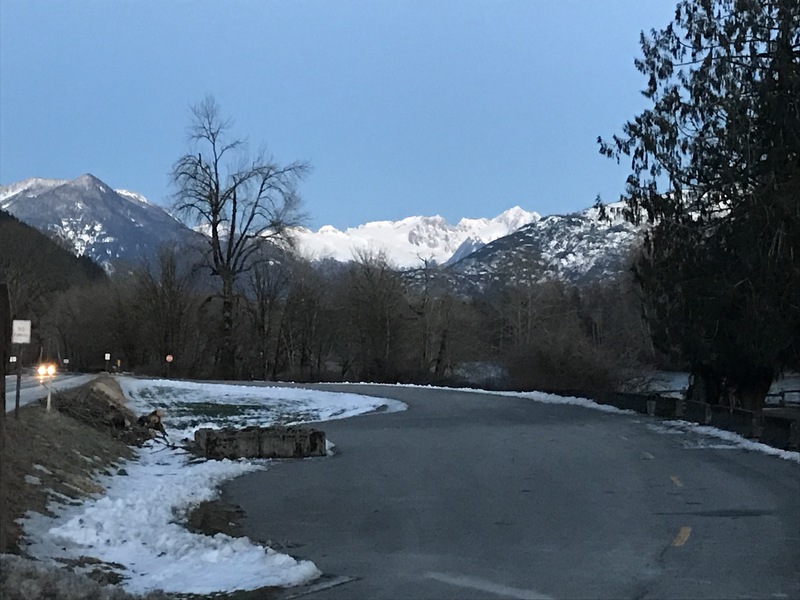 It was a quiet, cold and beautiful weekend in the upper Skagit Valley. 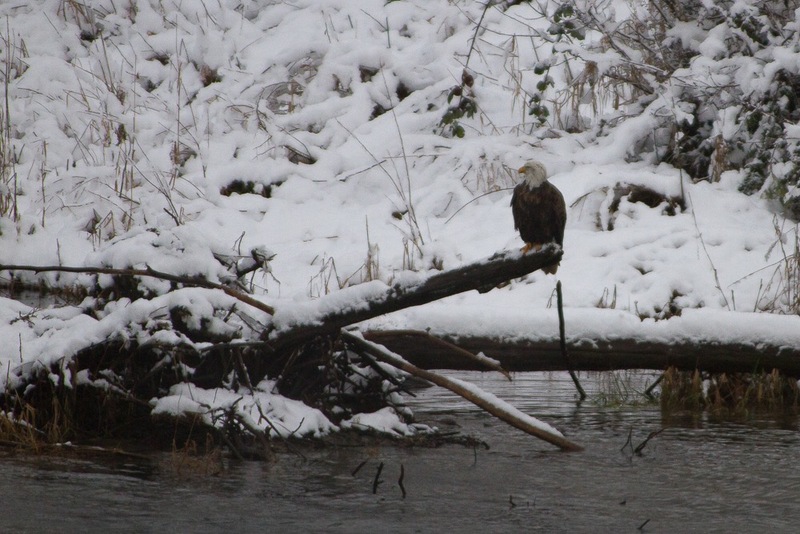 The threat of snow and ice kept many folks away, but those who ventured out saw a fair amount of eagle action. Sunday morning the landscape was covered with about 6 inches of fresh snow. Though a cold front was on its way, the temperature climbed above freezing with sunny skies. When we were not being wowed by the scenery the eagles put on an occasional show. As the weather was changing, there must have been some mighty thermals, because the eagles stayed relatively active, with plenty of swirling, soaring and ketttling. 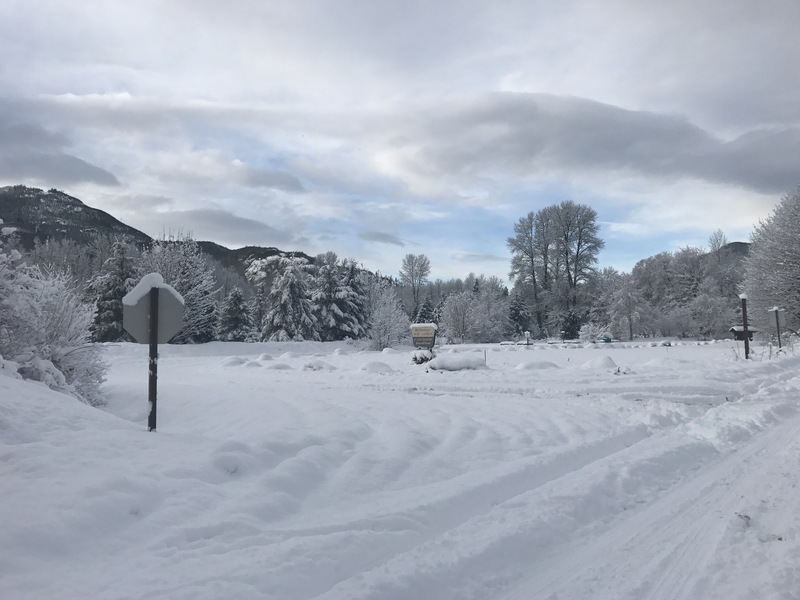 Ranger Matt and two volunteers led about a dozen folks through Steelhead Park campground, past the slough and through the meadow to look toward the confluence of the Sauk and Suiattle rivers. There were many eagles on the move, flying upstream. Where are they headed? So many times I have wished we could understand eagle language as they talk to one another. With cold east winds moving in, we closed up shop a little early Sunday afternoon so we could all get home safely before the roads iced up. A very happy and successful holiday of eagle watching! Weather permitting, we will be back next weekend. Gonna be a cold one- make sure to bundle up. See you then! Overnight snow has made Marblemount a winter wonderland! 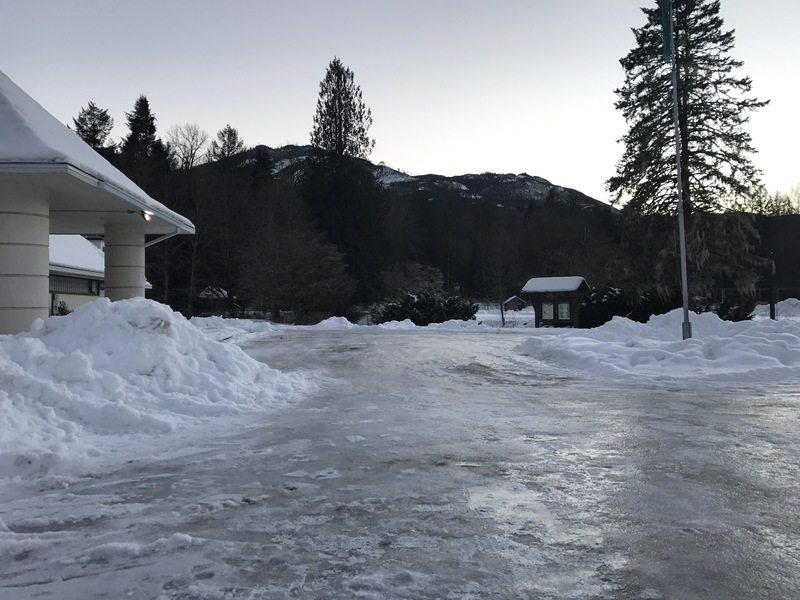 Highway 20 is plowed, but watch for ice. 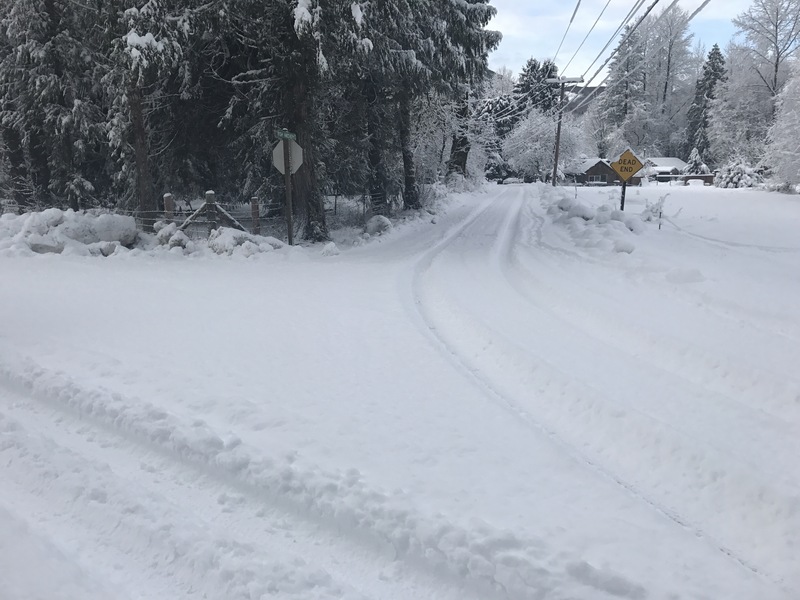 Travel to Rockport via highway 530 is not recommended. 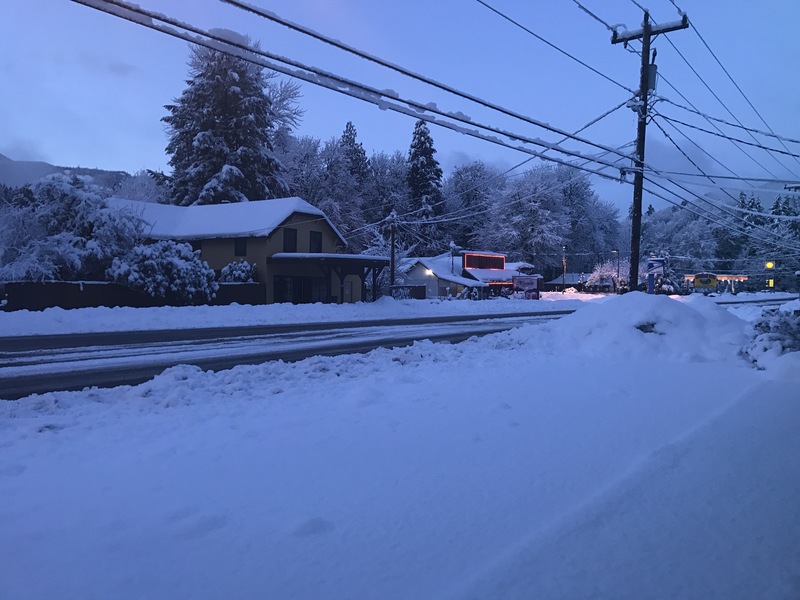 The report from Darrington is that there is much more snow and the road is in poor condition. 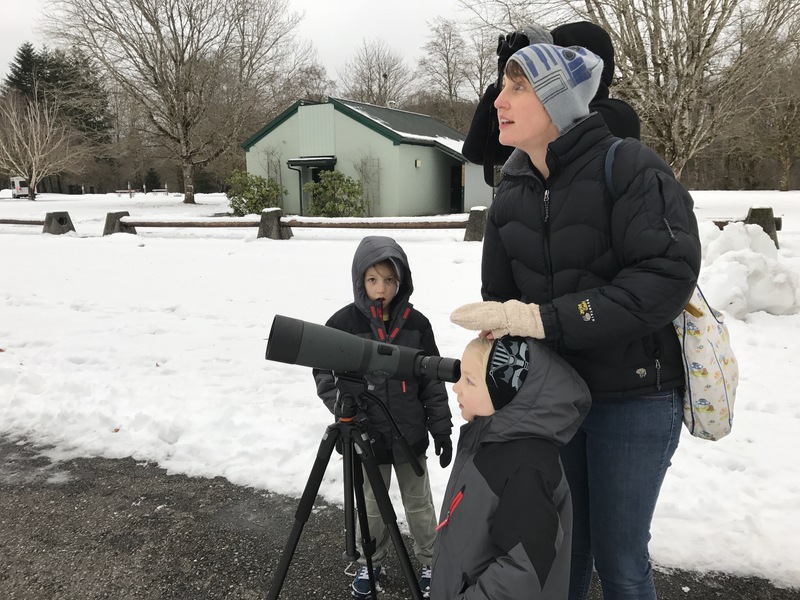 Eagle watchers will be running with a smaller crew and shorter day today. Temperatures are expected to drop throughout the day, so stay warm and stay safe!